The gemstone golems are a set of constructs powered by an original magical jewel heart. Around this original gem the rest of the golem is shaped by the wizard into a humanoid shape. 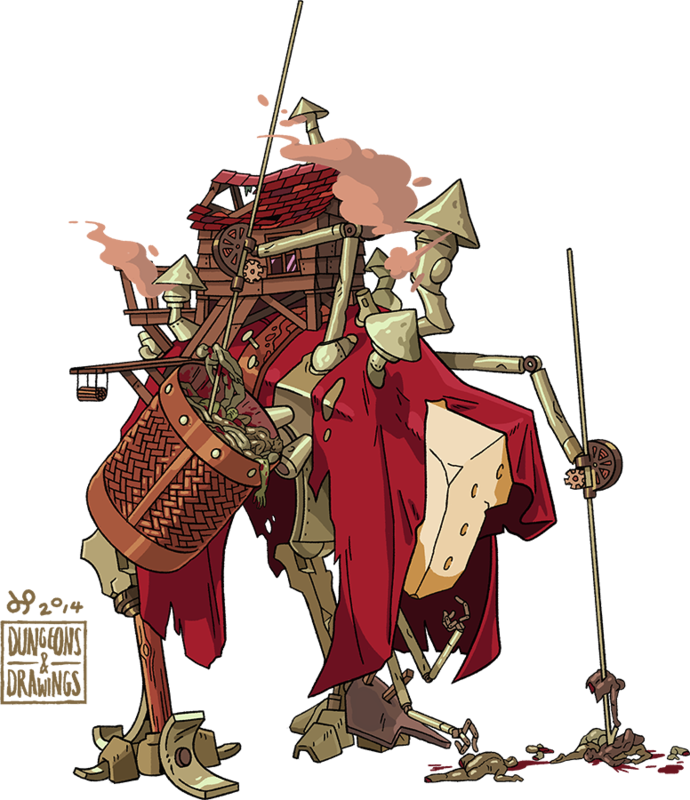 There are many types of golem and behave in an automated way, but gemstone golems will often ignore the orders of their creator to follow the innate magic of their gems. There are three known types of gemstone golem: diamond, ruby and emerald. Emerald gemstone golems are curious, seeking to travel where they want. 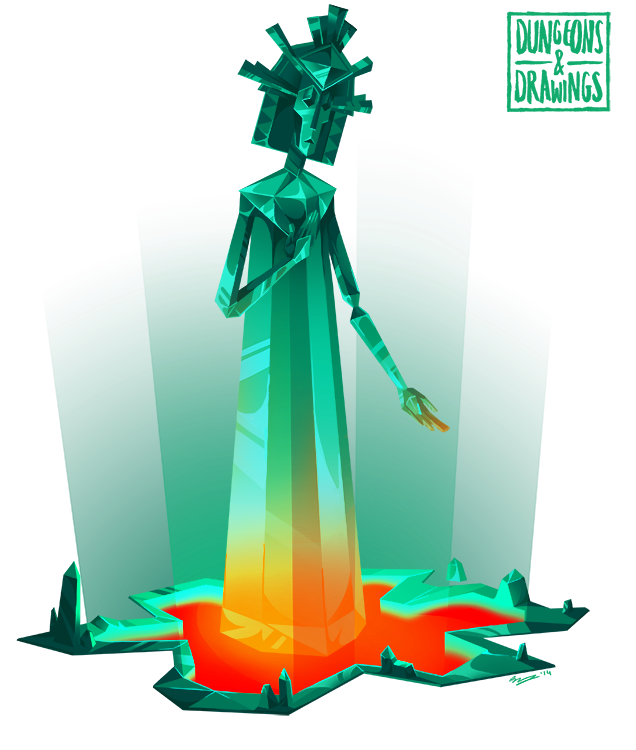 This innate desire towards freedom leads them to shirking the bodies that their wizard creators give them; all emerald gemstone golems for some reason will eventually become vaguely androgynous women. Among the most powerful giants are the storm giants. They rise over other giants both magically and in stature, and even the weakest of this kind can easily set itself up as a local deity. 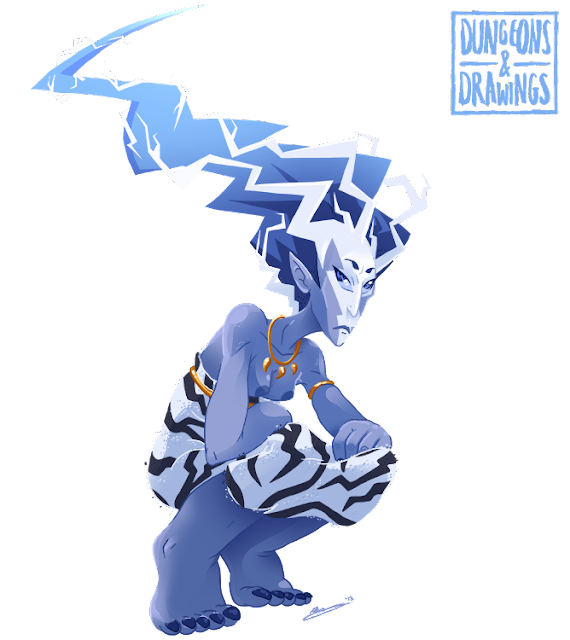 All storms giants can call down lightning and manipulate the weather in any terrain, but prefer to lead isolated lives on mountains. Storms giants are (usually) a peaceful race, preferring lonely lives and silence. Worship is sometimes forced upon them, since nearby settlements of lesser creatures may give them offerings in exchange for bountiful weather. The description of storm giants in the Monster Manual is a bit confusing to me. For example, they're generally green skinned, with some of them being purple. I guess storm clouds can turn a weird shade of yellow sometimes, but I haven't seen any green ones. Though with some research I've learned that there are greenish storm clouds -- usually ones that contain hail or will produce severed thunder or tornadoes. Storm giants also have water breathing, but they're neither aquatic creatures or live in an aquatic environment (they live in warm mountains). Maybe it's because of floods? I know the storm giants of D&D are largely inspired by Greco-Roman and Scandinavian mythology, but I've gone for a more Eastern look with this. It's ripped off of inspired by a group of oni-like people from the game Okaminden who live in the cloud-city of Thundercloud, who wear tiger-patterned robes and skirts. By the way, I love the Okami games. They just so pretty. She had been born an age ago, and she could no longer remember her original purpose. It had changed so often - she found it easier to concentrate on the present. Life was simple. Pick the bodies up. Put them in the baskets. When the baskets are full, take them to the Pit. Start again. Simple. She knew the Master appreciated her work, although she would have continued to do it even if he didn't - she had been given a Command, a single compelling instruction, to keep working. Years ago, she remembered, she had found time to wonder what someone would even want with so many bodies, or (come to think of it) why so many bodies were just scattered about among the fields in the first place. But she had lived for so long, and she knew that such complicated thoughts led nowhere. So she concentrated on her work: pick the bodies up. Put them in the baskets. When the baskets are full, take them to the Pit. Start again. Another of my favourite constructs for y'all. The Cadaver Collector is one of those monsters that actually seems sort of sweet, despite its connections with, y'know, cadavers. 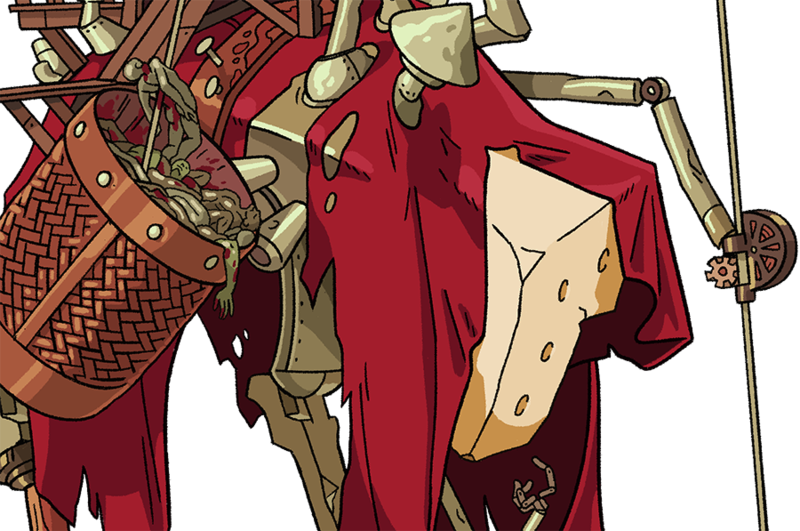 Referenced Howl's Moving Castle a lot here, as well as the steampunky robots in the Dinotopia series. I'm not actually that keen on steampunk as a design aesthetic (out of pure snobbery really - a LOT of people like it and it can get a bit style over substance) but it was fun to do something that leans in that direction. Check out the detail shot below, too (the linework stuff I've been doing lately seems to benefit from this). ALSO I ran the first session of my campaign yesterday, and it seemed to go great! The party enjoyed planning out a freeform route to the actual dungeon (I drew a big map of the region on the table and they basically sat round and planned out exactly how they wanted to get there). They ended up going a way I didn't expect, which was cool. They beat up a group of hobgoblins & bugbears on the way (which an online CR calculator ASSURED me would be a fair fight but the bugbears got stomped. I guess CR calculators don't account for tactics?) and we worked out that the group halfling (an Inquisitor* named Wislo) actually has less STR than Fitz's pet crow. After they got inside the Keep via a secret passage they had a pretty tense stealth section with the party uncovering a secret armoury. Eventually they ran into a sentry on the upper battlements who was looking out the other way, so our half-orc (a fighter/ninja** named Sev) decided to sneak up on him to take him out silently. Unfortunately for Sev, he rolled a natural 1 on his stealth check*** - an automatic fail - stubbing his foot on a stone and yelping in pain. At this point the party is pretty screwed, because this guard has a signal horn and there are a good 30 or so soldiers nearby who will come running, completely scuppering the stealth element of the mission. Nevertheless, I roll a cursory perception check*** for the guard, to see what he hears. To everyone's surprise, I also roll a natural 1, also an automatic fail! The guard is somehow completely distracted by something to the extent that he doesn't hear the shout of a disgruntled half-orc not two paces behind him. This works out in Sev's favour and he successfully stealths the rest of the way up to the guard, sneak attacking him with a greataxe. Success! It was pretty cool. We have our next session in about a month, so stay tuned for more updates. Next time I will take pictures! * Inquisitor is a base class in Pathfinder! They're sort of like paladins that don't mind getting their hands dirty. You can take it from level one, they get some pretty cool abilities in the cause of stomping HERESY. ** Ninja is an alternate class for Rogue in Pathfinder. They do a lot of the same stuff Rogues do but with a bigger focus on stealth plus some specific ninja-themed abilities (like creating clones to confuse the enemy). *** One of the nicer little ways that Pathfinder streamlines the game process is by slightly simplifying skills. Spot and Listen are amalgamated into a single Perception check, and Hide and Move Silently are combined into Stealth. It's a small change, but one that really helps to untangle things.